As fitfully brilliant as they can be, the Matmos of recent years has been more of a project that I respect and occasionally find fascinating than a project that I genuinely love. At the risk of torpedoing whatever experimental music cred I might have, I fear they might genuinely be a bit too far out for me…or at least too constrained by their passion for focused conceptual themes and unusual materials. Nevertheless, I am always quite happy to investigate whatever kitschy and perverse lunacy they have cooked up with each fresh album, as the results are never boring. In the case of Plastic Anniversary, Drew Daniel and M.C. Schmidt gleefully embark upon a morbidly funny celebration of all things plastic, assembling an arsenal of toilet brushes, breast implants, police shields, synthetic human tissue, and some hapless Bread records to make a host of bizarre and colorfully cartoonish sounds. As usual, Matmos' sheer ingenuity and resourcefulness is second to none, but the most compelling innovation of all was the duo’s decision to enlist Deerhoof drummer Greg Saunier and a high school drumline from Montana. Plastic Anniversary is an album with a very intriguing and deliberate arc, unfolding a bit like a fun house that slowly transforms from the cartoonish and the slapstick into something considerably darker and more visceral. Naturally, that journey roughly corresponds to an escalating conceptual heft that mirrors humanity's dying love affair with all things plastic (this is a Matmos album, after all). The opening "Breaking Bread," however, captures the album's aesthetic as its most unapologetically kooky and light, as Schmidt and Daniel concoct a blocky, plonking, and squelchy groove "built entirely out of the plucked and twanged fragments of broken vinyl records by the Seventies soft rock group Bread." By the second piece, however, the album has already gone quite far off the rails sanity-wise, as "The Crying Pill" is something resembling a manically fragmented mash-up of cheery fanfares, lysergic synth-like melodies, and skittering percussion. It is admittedly endearing that it came from an exercise ball, a jockstrap, and an "amplified DNA kit," but it feels like being trapped in the head of someone with extreme ADHD trying to replicate marching band music with a cheap '80s synthesizer. For me, "The Crying Pill" is quite a rough endurance test, an experience similarly replicated by the "cod-medieval martial drums and horn fanfares" of the benignly radiant title piece. I doubt I would have continued much further if it were not for the early presence of "Interior With Billiard Balls and Synthetic Fat," which beautifully approximates the sickly and smeared synths of Aphex Twin's Selected Ambient Works II with some pool balls, some dominoes, and an artificial corpse-replacement tissue used at medical schools. Fortunately, the album's second half has a considerably higher hit rate than the first, culminating in the brilliant centerpiece "Collapse of the Fourth Kingdom." The title is a reference to plastic's early and optimistic projected future as a new kingdom beyond the animal, the vegetable, and the mineral ones and Matmos give its collapse a hell of a raucous farewell party, unleashing the Whitefish High School Bulldogs drumline at their full percussive fury (along with a crazed cacophony of whistles and duck calls). Aside from its explosive physicality, the piece is also quite an impressive tour de force for Matmos' production talents, as it morphs into a simmering, submerged-sounding, and duck call-centric groove at one point, then later warps all of the horn-like sounds into a deflating grotesquerie. Elsewhere, "Thermoplastic Riot Shield" is a fitfully violent eruption of psychotic squelching, gnarled textures, and pummeling percussion. The delightfully creaky and shuffling "The Singing Tube" is a more minor gem, unfolding as a polyrhythmic vamp conjured from PVC pipes, toilet brushes, and plastic pellets called "nurdles." The are a few other similarly pleasant rhythmic vignettes on the album as well, the best of which is the skewed exotica of "Silicone Gel Implant." I also quite like the heavy, ringing groove of "Fanfare for Polyethylene Waste Containers," though it is undercut by its more musical aspects (it sounds like someone trying to play New Age music with a plastic tuba). Fittingly, the album closes with three minutes of windblown desolation, evoking a post-apocalyptic wasteland left by "the oceans of garbage that now choke our world." Unsurprisingly, that morbidly prophetic "field recording" is also a product of plastic, painstakingly assembled from the manipulated sounds of bubble wrap, straws, and plastic bags. 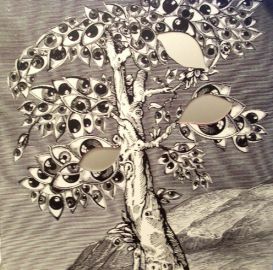 It is quite a poetic conclusion to a very strange, disorienting, inventive, and unique album. 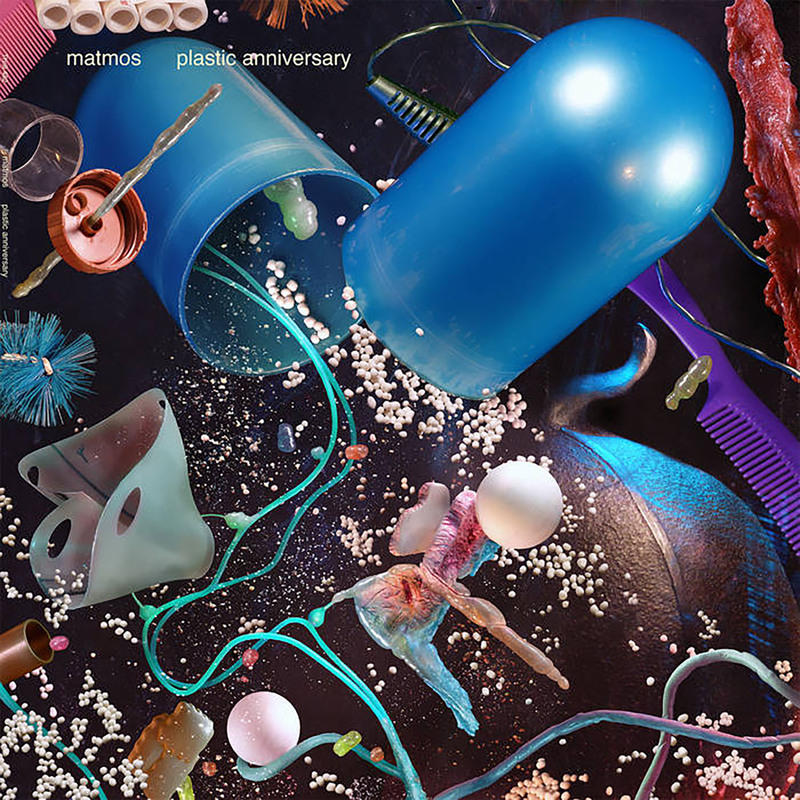 I suppose all of those same adjectives could apply to nearly every Matmos album to some degree, but Schmidt and Daniel made a major creative breakthrough with Plastic Anniversary’s "it takes a village" approach. While no one surpasses Matmos at dreaming up a host of weird and vaguely disturbing sounds, that deranged and hallucinatory palette works best when it has a strong melodic, harmonic, or rhythmic foundation supporting it. In the case of Plastic Anniversary, Matmos' vision is elevated to a new plateau when Saunier and the Bulldogs are turned loose. For my taste, that does not happen quite enough, making Plastic Anniversary kind of an uneven album peppered with flashes of genuine inspiration and brilliance. Sometimes I wish Daniel and Schmidt were more drawn to the appeal of writing great songs than the appeal of "can we make an entire song with just a salad bowl?" (answer: yes, they can and they did), but I suspect the road that leads to a masterpiece like "Collapse of The Fourth Kingdom" could have only been built from restless experimentation, toilet brushes, and breast implants.